I love self-striping yarn as much as the next person, but sometimes just the joy of seeing the next colour coming through is not quite enough to get through knitting in plain stockinette. Of course, I could always knit an allover pattern into my sock, but the idea has never appealed. An idea came to me one day as I was browsing a stitch dictionary and came across an intriguing colourwork chart: What if I could use the stripes to work with me to create a colourwork pattern instead? I played around with a sample, and was delighted with what I discovered. I thought: “This would be a really cool pattern to submit to Knitty!” Very happily, and much to my super excitement and terror, they did choose to publish my pattern! Thanks so much Amy and team! This has been a long while under my hat – if you are a long time follower, you’ll notice the pics were taken around my former place of residence. I am very pleased to show you the “Geek” socks that are out in Knitty today! So named because they really “geek” me out! These ones are from Doespins, in 80% merino, 20% nylon sock yarn, and called Limestone. The stripe is thick/thin, and it still works! You can see the way the stripes look without the patterning in the cuff, heel and toe. Finally, I had to try some in Stray Cat Socks. The super zany colours from this indie dyer just cry out to be played with! Again, the width of the stripe is different, but it works just the same! Now I have a hard time not knitting my self-striping socks in this style. It just makes it so much more interesting! It is also a very easy repeat, and the most ‘difficult’ thing about this pattern would be to be brave enough to try a new style of heel. I used an after-thought heel because I could not think of a way in which I could still maintain the patterning when knitting a plain heel flap. Normal heel flap gusset shaping does not allow the pattern to flow and would totally ruin the look of the sock. It may be possible to use a short-row heel to shape the heel and not have the stripe disrupted. I have not tried it. Kb, who test knitted the pattern beautifully, used an alternative version of the after-thought heel that also looks good. This is her version in rainbow self-striping yarn. I think she’s done an amazing job! The socks are knit cuff down, but you could very easily reverse engineer the pattern to knit it toe up if you prefer knitting in this style. Thanks again to the Knitty team for publishing (and editing) my pattern, my wonderful son Tim, for photography, Kb for being such a wonderful test knitter, and the interesting discussions I had with Karen Berthine about the design during the writing phase. I have learned a lot from Kate Atherley (Knitty’s Managing Technical Editor) about writing clearer patterns too. I do hope you enjoy knitting these socks! Categories: Designing, Finished Objects, Socks | Tags: Doespins, FOs, Geeks, Happy go Knitty, Knitting, Knitty, New Zealand yarn, self-striping yarn, socks, Stray Cat Socks | Permalink. They look fantastic. Very clever pattern. Congratulations. Congratulations! These are super. What an ingenious way of adding a little spice to self-striping yarn! Woot, woot, congratulations on hitting the big time! Lovely socks. I am such a fan of self-pattrning yarns. I am sure Helene from Happy Go Knitty, and all the other indie dyers will be thrilled with your efforts, and I am sure all will get good sales from it! I think I might even try them myself. I am knitting Happy Go Knitty in a striped BFL sock colourway toe-up, and I too have kept the stripes going, but my breaking the yarn over the front foot. I couldn’t bear to have the stripes ruined! and they look beautiful. Congratulations. Those socks look amazing. I’ve been MIA from blog reading and writing for a while now, so not sure if you remember me, but when I saw these socks on Knitty I just had to pop back to your site to say congratulations!! 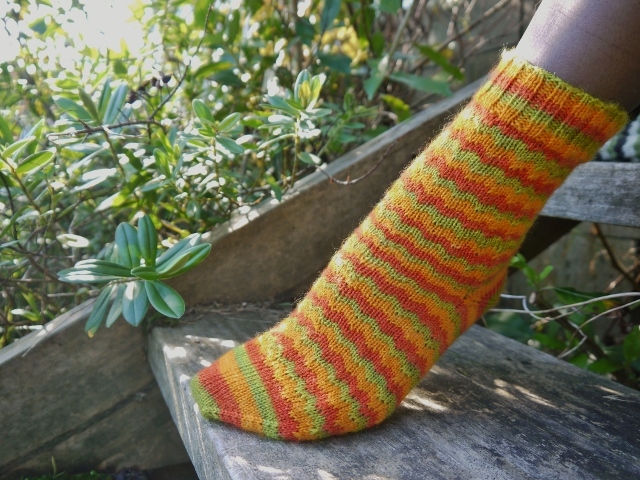 These are lovely socks, and I’ll have to give this pattern a whirl with my mountain of self striping sock yarn! These socks are genius, I love them so much! I have a few self-striping skeins in stash and I haven’t used them yet because I couldn’t bring myself to knit plain stockinette. As soon as I finish a few of the current socks on the needles, this pattern is definitely going to be knit! I so love those bold rainbow socks. Ho’omaka’i on getting this pattern into Knitty. Hurrah! Congrats on getting that pattern out. The pictures are lovely as is that wonderful pattern. Oooo, I love them! Definitely my fave out of this issue. 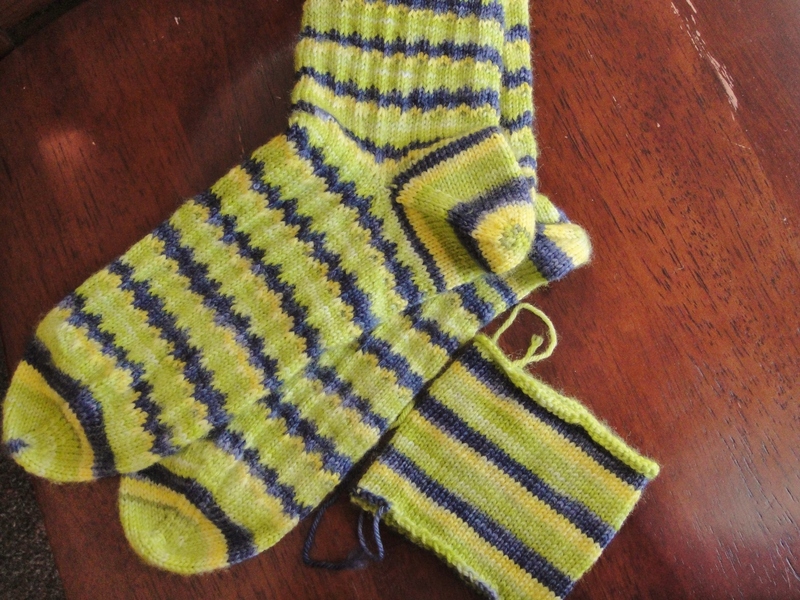 I need to get some self-striping sock yarn pronto. Congratulations! I haven’t tried any self striping yarns yet, but I may have to try this if/when I do. Oh wow, that is super exciting, congratulations I’m so pleased for you. 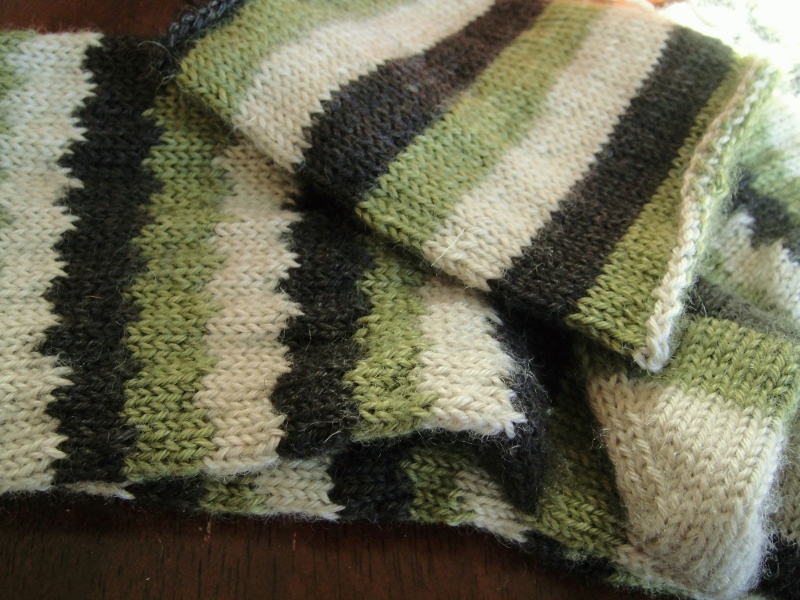 The pattern is great, love the stripes, a good reason to get some stripey yarn. 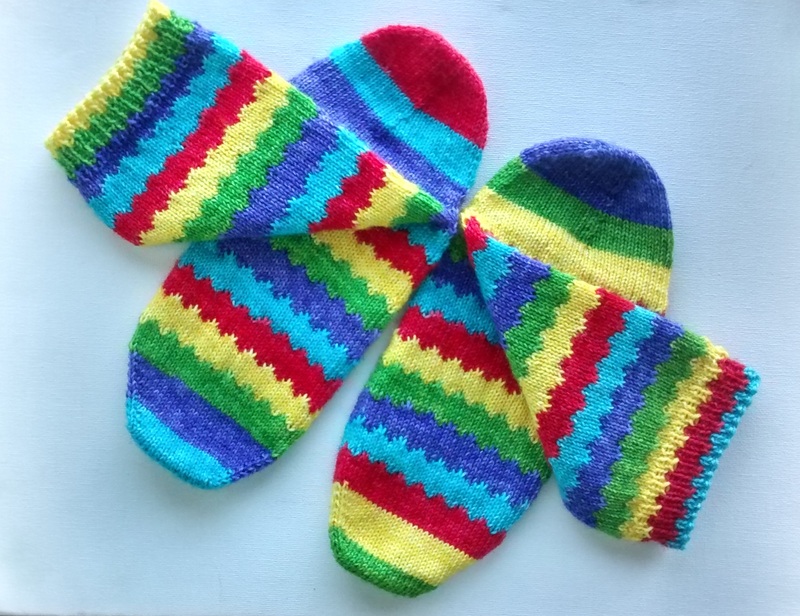 Very fun pattern and a great way to add a little more excitement to striping sock yarn!